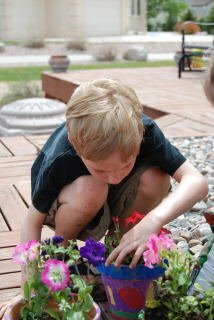 Today we decided to plant flowers. I know, I know, they will only last a couple days and the deer will eat every last one of our beautiful flowers but it is still fun to plant them and attempt to keep them alive. I have tried every recipe and idea to keep the deer away from my plants but I have to admit that I love seeing them (the deer) in our yard so much, it doesn’t bother me that they graze on my petunias. 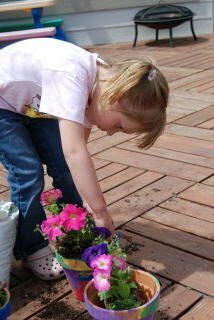 After church, we headed out to pick out flowers for our pots. 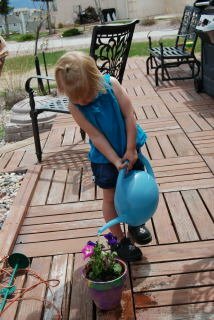 The kids each picked out a couple special flowers for their own pots. 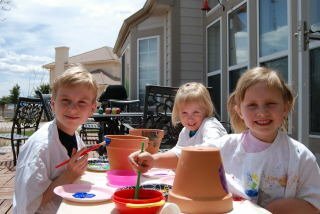 Once we were home, they painted their pots with bright colors and filled them with flowers. Once all our flowers were potted and strategically placed (on top of the picnic table and hanging from the eaves) Sam, Alice and Paige played on the swing set for the rest of the afternoon. Another fun filled day down and back to school tomorrow. Only 4 more days for Sam and he will officially be done with Kindergarten. Alice’s last day of school is tomorrow and she has her preschool graduation. I really cannot believe that she will be going to Kindergarten. She just doesn’t seem big enough. Two words that send shivers up my spine- SUMMER VACATION!!! Just kidding, we have lots planned and it will go by in a flash and I will be so sad come August when they all head off to school. I hope that everyone had a great weekend. We sure did!! Glad to finally get to see your blog. The pictures of the kids were great. I loved their pots.